Bust a move! Astronauts make regular trips into a shallow part of Key Largo to simulate asteroid missions and learn about procedures that could be used in space. The new crews for NASA Extreme Environment Mission Operations (NEEMO) were just named, which means we have more of these neat photos to look forward to. Check out some of the past crews’ activities below the jump. 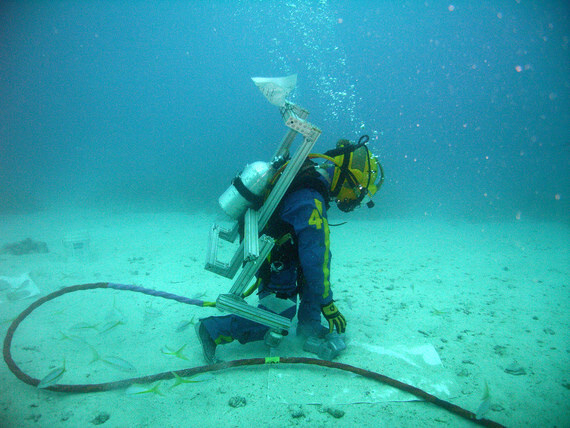 – NEEMO 19 (Sept. 7, seven days): “The evaluation of tele-mentoring operations for ESA. Telementoring is when a crew member is given instruction for a task by an expert who is located remotely but is virtually present via a video and voice connection,” NASA says. Crew members: Randy Bresnik (NASA), Jeremy Hansen (Canadian Space Agency), Andreas Mogensen (ESA), and non-astronaut Herve Stevenin, ESA’s head of extra-vehicular activity training. To read more about NEEMO, check out the project’s webpage.